philanthropy • Max Blog • Max. your best interest. 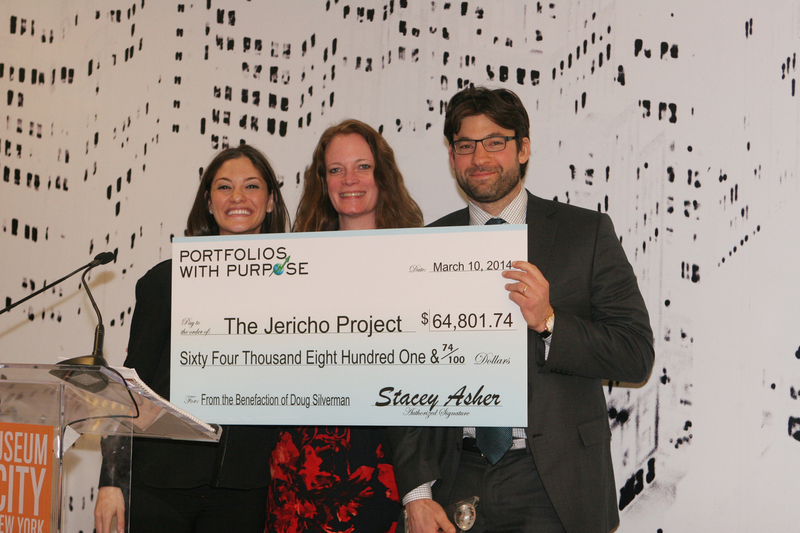 Portfolios With Purpose founder Stacey Asher (left) presents a check to the Jericho Project. On a trip to Tanzania in 2011, Stacey Asher discovered that the charity food pantry where she was volunteering was vulnerable to shutting down in situations where it didn’t have enough money, leaving 250 local children hungry. Asher, on vacation from her job in hedge fund marketing in New York City, asked how much it cost to fund the operation for a month. The answer: a mere $250. Asher figured she would have no trouble canvassing her network of finance friends back home to ensure a steady stream of donations that could keep the kitchen open. Then she thought, what else could she do to support her friends’ favorite causes while asking them to back hers? The model she came up with is a cross between fantasy football and stock-picking: a stock contest that lasts a year and involves choosing 5 stocks. Participants, 90% of whom are finance professionals, pay an entry fee and choose a charity to support. The money that’s raised goes to the charity chosen by the winner in each contest category. Portfolios with Purpose launched in 2012 as a beta, raising $25,000 for charity; the next year, after a public launch, the nonprofit raised $185,000. Based in New York City, the nonprofit now attracts some of the biggest names in the world of hedge funds and Wall Street. Basis Points asked Asher about her idea of linking stock picking and philanthropy, and where her nonprofit is headed next. – Is stock-picking something you do yourself? One of the many reasons I started Portfolios with Purpose was to create a contest in which everyone with an interest in stocks and philanthropy could participate. I was always interested in the stock market, but never confident enough to actually invest outside a small investment account comprised predominantly of index funds. Portfolios with Purpose offers a fantasy stock competition that is completely anonymous unless you are in the top standings. I hope this provides even the most timid of investors to test their skills and see how they rank amongst the top investors in the world as well as against their peers. – What are the most popular charities/causes for contestants to choose? The three most supported charities this year include Wounded Warrior Project, New York Hedge Fund Roundtable, and St Jude Children’s Research Hospital. We have over 200 different charities represented in the competition. Each charity listed includes personal comments from each player about why he or she chose the particular charity as well as a direct link to each charity’s homepage. – What’s next for PwP? With the 2015 contest only a month away (registration opens on October 15th), we are working hard to make sure we have another successful year. We also have PwP Mini Games launching on Oct 1st. PwP will now allow friends, firms, schools and any other social groups to customize and host their own competitions throughout the year. Mini Games will open up more opportunities for people to compete, have fun and raise money for even more worthy charitable organizations.